November 22, 2017 Amy P.
I got into a real rut with regard to cooking while we lived in Arizona. One of my goals with this move is to slow down a little, breathe a little and get back to the habit of eating home-cooked food. To that end, I'm determined to try four new recipes each month. I was in a real rut-rotation of tacos, chicken/rice/veggie and burgers there for a while, even if the burgers were grilled at home. Now I want to branch out a little bit and bring it all back to that feeling of having something warm on the stove, something soothing in a bowl and something fresh from a cutting board rather than re-heated after pulling back a thin layer of plastic. 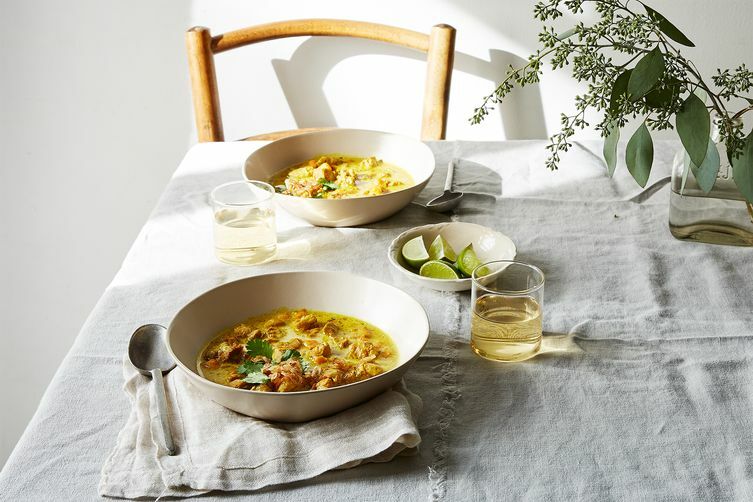 This recipe comes from Food 52, my favorite resource for all things food. I made it on a cold night, mid-week, when we were all sagging a little from our constant activity schedule. The meal took a while to make. It says to just simmer for 30 minutes, and that left me with this idealistic notion that the whole thing would take maybe 40 minutes. Bless my little heart. I cooked for at least an hour. Now, I will say that during that time, a man came to measure our windows for blinds; my kids got into a fight that included throwing shredded cheese at each other, and I took two phone calls. But, that's the reality of family life. So, just don't think this recipe is a quick fix unless you're single, have a quiet kitchen and can chop veggies like a pro. All-in-all, it was a hit between my husband and myself. Our son liked it well enough to eat a full meal. My daughter was at ballet and, upon return, said she wasn't hungry when she saw it was akin to curry. After many years of trying to force my kids to eat meals, I've given up that battle (for now). I served this with chopped cilantro, steamed broccoli and over jasmine rice. I'd make it again in a heartbeat, especially as leftovers were equally as good. I just wouldn't make it again with kids underfoot, the window treatment guy at the door and the phone ringing off the hook. This might be better served on a lazy Sunday afternoon, when the kids are running amuck in the neighborhood and my husband can field calls. This is a GOOP recipe. Readers, I can't lie: GOOP recipes are awesome. I know people want to mock that site and all the expensive lifestyle products, but all of the recipes I've tried off GOOP have been solid. I'm not going to say this is the best thing ever. In fact, it didn't taste anything like pizza crust. But...it was good. I ate half the pizza (I used my own toppings rather than the mediterranean suggestions), and my husband ate the other half. We were both impressed. It wasn't pizza (I made 'real' pizzas for the kids), but it was equally as good. It reminds me of when we eat Bolognese sauce over polenta rather than pasta. It's not the same, but it's just as good. The crust baked up nicely, just like the recipe said. I followed the recipe to-a-t. It did take some time. The draining the cauliflower through a kitchen towel business wasn't super pleasant. It took a while to cool down. The said towel, tossed in the laundry later, was a real doozy a day later. I had to just throw it out from the smell of it. Lesson learned; rookie mistake. I'd make this again, for sure. In fact, I have another head of cauliflower in the fridge. On pizza nights, since I'm gluten-free, I will absolutely make this if I have the time and kitchen space to be actioning multiple meals. I've actually had this recipe before, when we lived in Pennsylvania a few years back. A friend, Erin, made it for a dinner party at which we all brought soup. It was, by far, the best of the night. I remembered it a few weeks back and thought I'd try it out myself. A few caveats: my husband doesn't eat onions, and my kids recoil from the sight of anything green. Thus, I tried to tweak this recipe a bit, omitting the onions/celery and anything green (except at the very end, when I added spinach to my own bowl). I'll say: it was a bit lacking, which I admit is my own fault. On its own, this recipe is a gem. Modified to meet the needs of my family's limited palate, it's less of a showstopper but still a solid addition to our rotation. I'll have to play with it a bit to get it right, but I am committed to it because this soup is both soothing and hearty. The house smelled lovely as it cooked, and the meatballs are easily prepared ahead, scooped out and left to rest in the fridge. My entire family loved the soup as it was, sans onions and all things green. A few weekends ago, my husband suggested inviting two families over for dinner. He suggested this around 2:00 in the afternoon. I had a 4:30 class to attend on my own, but for some inexplicable reasons, I said: SURE. An hour later, I was at the grocery store searching through recipes with one hand and tossing items into the cart with another. 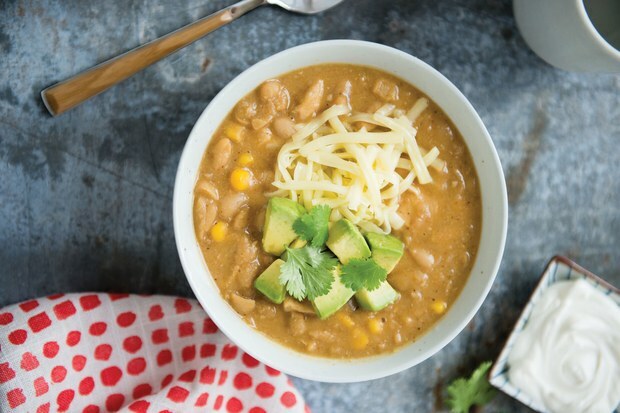 I settled on White Chicken Chili because the day was cold and dreary; the recipe feeds a crowd, and the whole thing looked easy in a throw-it-together sort of way. All-in-all, that's exactly how it turned out. I served the chili to six adults, and even though I doubled the recipe, we had just enough. I added chopped avocado, cilantro and cheese for toppings, and put a big bowl of Fritos on the table. Everyone finished their bowls, and the pot on the stove stood empty. According to all of the dinner guests, it was a hit. One woman, who is from Spain, wasn't sure what exactly I was putting in front of her. The Fritos seemed to throw her off even more, but she dug in and seemed to enjoy it. This recipe is easy to follow, easy to prepare and true comfort food when the weather turns bleak and one needs to hunker down. I didn't take pictures because I think doing that in a social setting is rude. That's it. I'm sure I'll make more than 4 recipes this month, what with Thanksgiving coming up (tomorrow!!!) and another week upon us. I'm re-learning the whole art of dinnertime since the move. I'll write more about that later, but let's just say: it takes more than plopping a bowl of food on a table and ringing the dinner bell (which is just my raspy mom voice). Hope everyone is in full Thanksgiving-prep-mode here in the US, and to all of you in other parts of the world, I hope your day is swimming right along. For tomorrow, I have a poignant, heart-breaking-but-inspiring post you'll want to check in for, even if you're not checking in tomorrow at all (when most of us will be up-to-our-elbows in pumpkin pie and spending time with loved ones).